Nice shot! ermm do you mind sharing with me here how did you achieve this color tone of this shot here? i hope to learn more from you! nice! There, i share my techniques. The rest of it is all up to you to create. You did it! I like your shot alot! Thank so muc for sharing, not only your photos but you also share the way how you pp the photos! Thank so much for your share! Oh! thank so much for sharing! so sorry if i bothered you with so many questions, trying to learn more from you. i think i will also include, shoot more and you can get. lol! cheers! are these also called morbid? nice one! now i can somehow grasp your style already and i like it. are these also called motion blurred? Excellent captures! It must very difficult to get these shots without any practise. Kudos to you. All these actions and movement caught on image. Thank so much for sharing! Oh.. ok. but you did pp on these shots right? PP??? oh no no i follow strict guidelines of photojournalism. I only boost it's contrast level. Right! you are so real. i mean literally, many others tend to pp their photos so much for their shots to look nicer. now im looking at 'real' photos. thank! 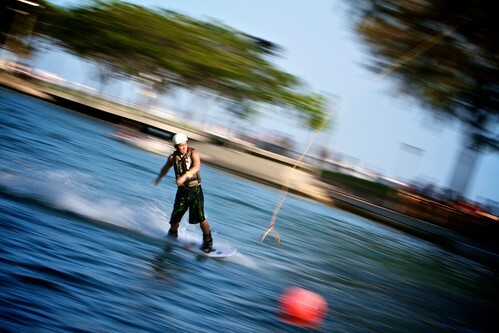 I have done these shots b4 in ECP cableski but it was never easy.. How did u do that? My arms just failed on me, maybe I should go practise again! hahaha!!! Sure! In that case, we can arrange again! My vote goes to the shot Adrenaline Rush. The compo is good and you have well cropped your photo, thanks so much for sharing.